Update: The acquisition of Coinjoos by HomeShop18 has just been confirmed. "The CoinJoos.com team is very excited to be part of e-commerce site Homeshop18.com," said Nitin Gupta, Founder & CEO, Coinjoos, to Techcircle.in. 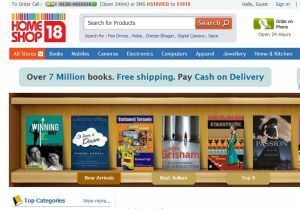 Previous Post (July 28, 2011 @ 19:34): E-commerce portal Homeshop18, owned by the Network18 Group, is in the final stage of acquiring an online bookstore. With this acquisition, the firm is looking to supplement its product categories with books. There are no further details of the deal size or the start-up involved. This news comes even as the company is raising Rs 100 crore from its existing investors â€“ SAIF Partners, Network18 and GS Shopping â€“ for scaling up its logistics, warehousing and technology platform. Homeshop18 is the No. 2 e-commerce site in India and it is vying closely with eBay India for the top spot, according to recent data from the Internet marketing research firm comScore. A spokesperson of Homeshop18 said, "HomeShop18 has nothing to comment on this, since the investment is in the early stages and it will take some time to announce it officially." MediaNama reports that the book retail start-up to be acquired is Coinjoos.com, by OnGraph Technologies. An e-mail query sent to Nitin Gupta, founder and CEO of OnGraph Technologies, has not elicited any response yet. Coinjoos currently retails over 10 million books on its site and also offers a rental service. The Noida-based OnGraph has another online venture called YouHaveDeal.com. Homeshop18 has recently added baby products to its site, which had underwent a re-launch. Top products on the site include digital cameras and the company CEO Sandeep Malhotra had told Techcircle.in that HomeShop18 accounts for 4.5 per cent of all digital cameras sold in the country. Other popular product categories retailed on the site include mobile phones, non-stick cookware and footwear. The company also retails books and has 7 million books with top categories as fiction, 'Mind, Body & Spirit', biographies and autobiographies, business and management, children's and computer and Internet related books. Books, according to industry experts, are not a sustainable e-commerce business on a stand-alone basis. Websites such as Flipkart.com and Infibeam.com, which began with retailing books, have diversified into other product categories such as handsets and consumer electronics. This move from a horizontal player into books will up the ante in the book-selling domain. HomeShop18 intends to become a 'virtual shopping mall' on the Internet, targeting aspirational buyers. It also runs a 24x7 TV channel and currently reaches 3,000 cities and 50 million households across India via the channel and the website. It has recorded 33 per cent rise in the number of orders executed overall in FY2011 while its revenues rose to Rs 71 crore in the year ended March, 2011.